It is better suited for hosting of a university. 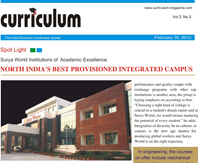 Promoted under the aegis of Surya World Educational Research & Charitable Initiative of the Rs. 16 billion Surya Pharmaceuticals Ltd, the campus is spread on a sprawling 60 acres of land on Rajpura-Ambala section of National Highway (NH-1), about 45 kms from Chandigarh. 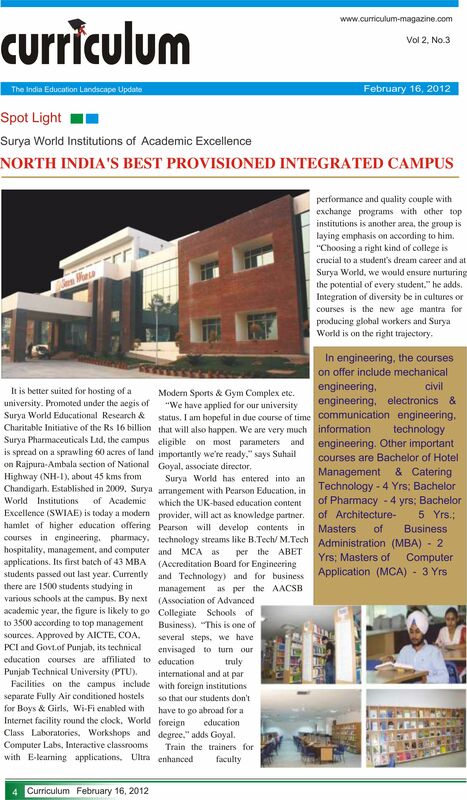 Established in 2009, Surya World Institute of Academic Excellence (SWIAE) is today a modern hamlet of higher education offering courses in engeering, pharmacy, hospitality, management, and computer applications Its first batch of 43 MBA student passed out last year. Currently there are 1500 students studying in various schools at campus. By next academic year, the figure is likely to go to 3500 according to top management sources. Facilities on the campus include seperate Fully Acir Conditioned hostels for Boys & Girls, Wi-Fi enabled with internet facility round the clock, World Class Laboratories, Workshops & Computer Labs, Interactive Classrooms with E-learning applications, Ultra Modern Sports & Gym Complex etc. Train the trainers for enhanced faculity performance and quality couple with exchange program with other top institutions in another area, the group is laying emphasis on according to him. "Choosing a right kind of college is crucial to a student's dream and at surya world, we would ensure nurturing the potential os every student," he adds. Integration of diversity be in cultures or courses is the new age mantra for producing global workers and Surya World is on the right trajectory.